Merry Christmas, Everyone -- and Happy Holidays. I'm thinking of all of you celebrating with your families and the impressive posts and research so many in the family history and genealogy community have done over the past year to share their stories and knowledge. I'm also thinking back to 101 years ago, when my grandfather, Josef Gärtz, boarded a train in Austro-Hungary to start his fateful path to America and the terror he experienced on that journey. 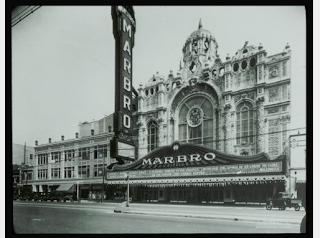 In honor of the 101st anniversary of that trip, I'm adding a link to the post I made on Christmas Eve last year to mark the centennial of his departure. 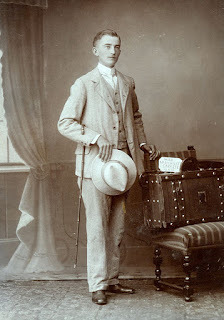 Click Terror Atop the Train to read the story of this twenty-one year-old's audacious manner of getting to the port of Bremen and my discovery of the diary which allowed me to share his story with all of you. August, 1941--when she and Fred were in the throes of falling in love. After being "Damn Mad at Fred" for not taking her out on New Year's Eve, Lil doesn't write in her diary for a couple months. 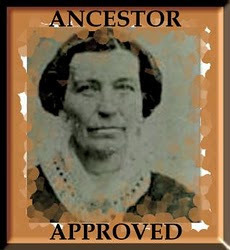 I'll tell you a little secret that she doesn't write about, but I happen to know from family lore. I'm quite sure her "damn mad" really translates to "damn hurt." After all those wonderful dates, all that kissing, all the passionate feelings she had for Fred, I think she just couldn't believe he'd let her down. Isn't anger so often "hurt" by another name, the two emotions so closely intertwined? So when Fred called the next day, to take her out to Math Igler's, a Chicago German restaurant, she said yes. After they had danced for a while an older couple came up to them and said that every year when they went out to celebrate the New Year, they looked for a couple that they wish they could be if they were young again. That night, they wished they could be Fred and Lil. 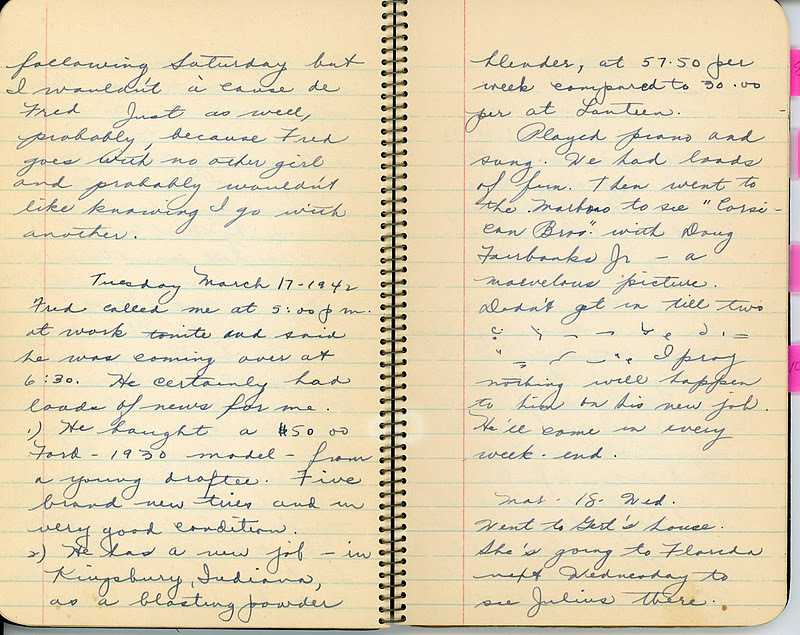 Mom picks up her diary again in March, and opens it with a little French and Latin (she had studied French in high school and enjoyed the sound of the language.) Burt, who rescued her on New Year's Eve, is giving Fred some competition. But maybe not as much as even Lil thinks. Tempus Fugit, n’est ce pas? Here 2 1/2 months have flow by before I got a chance to write in my little diary again. March 1 (Sunday) Burt took me to El Rancho Grande. We had just a wonderful time rhumba-ing. Stayed out till 3:30––we just didn’t want to go home. Had 6 Cuba Libras and they didn’t faze me a bit. For a while I just couldn’t decide––did I like Burt or Fred better. Never thought there’d be the faintest doubt about my ever preferring Fred. I still think now that Freddie is my #1 boy. There for about a month (February) Freddie and I went out each Saturday and always had a marvelous time. Never yet had a dull time with him…. I got to feel kind of retrospective tonite. Friendships seems such a temporary thing, even the most permanent ones. You cling to many for the sake of old times, drifting into new groups who have the same interests you do, but I guess that’s life. I’d hate to be without friends…. I wonder whom I shall marry. I’m sure some day I shall for I would not like to be single forever. Up to now I certainly am glad I was single. Have had just wonderful times. I wouldn’t want to marry Burt. I have always vowed never to marry a traveling man; life would be just too lonesome. Fred would be fine for me, I’m sure. I love him [and] am sure he loves me (although never has he said so). Still, I’d hate never to see Burt again. Some day I shall have to give up one––or perhaps they both will give me up. Who knows? Then I’ll be lonesome. Her vow to “never marry a traveling man,” will come to have a sadly ironic ring in the next decade––an outcome she couldn’t possibly have predicted when she was dating and looking for Mr. Right. Next week: "Explosive" News from Fred as he gets a new job and makes an exciting new purchase! 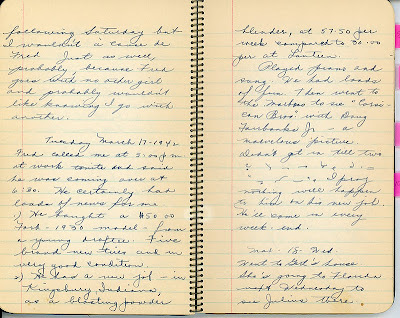 Last week I posted Lil's entries into the new diary she had started on the eve of 1942, three weeks after the bombing of Pearl Harbor and America's entry into World War II. If you'd like to see how the war had already begun to affect every-day Americans, see Lil's ruminations at Pearl Harbor Day-A diarists response to war. 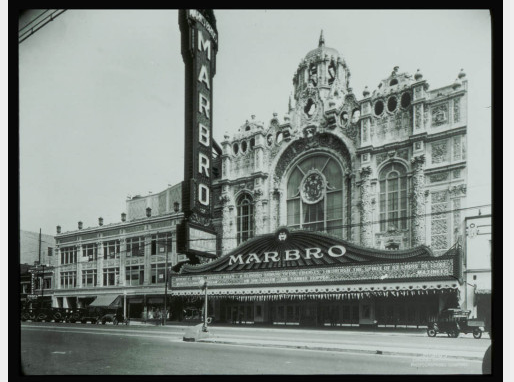 If you'd like to start reading Lil's entries of falling hard for Fred Gartz from the get-go, start at Falling in Love 70 Years Ago and just scroll through to the present. 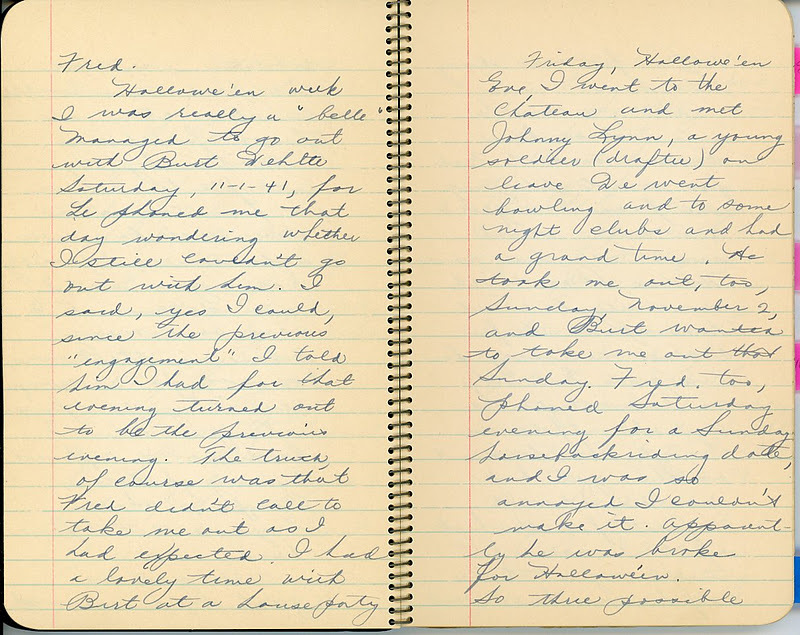 Lil had met a "grand young man", the "Burt" of this entry, in late October, 1941, on a Saturday night when Fred had failed to ask her out (See Trouble in Paradise). Now Fred's got some serious competition, and Burt has stepped in to take out Lil for New Year's Eve. Burt, however, came through for me. (Something always turns up so that I go out Halloween and New Year's Eve). He said...he would be in Indianapolis Tuesday and Wednesday and possibly wouldn't get back in time. But at 7:00 he phoned [and] said he made it back. I'm waiting for him now and hope he comes soon for I want to be some place when 1941 leaves us to take its place in history. He's a grand guy, sort of on the bashful side when it comes to romancing. He didn't kiss me until our last date, Monday, and even then he doesn't put any feeling into it. But it's kinda nice when someone goes with you for your "delightful" company. He's a swell dancer too. I'm particularly fed up with Fred now and think it's damn cheap he didn't call me up for New Year's....Perhaps this is the end of my "story book" romance with "old stingy" Fred. Too bad. It started out so fortuitously too. But this neglect has killed something in me. I don't care now whether he's drafted or not and whether or not he calls me again. (Hope Burt comes soon--it's 10:45.) I want to get out in a crowd on New Year's. Well, now to put on my gorgeous green rhumba dress––hand made by Koroschetz [not sure if she means she made it or her mother], with black felt hat and green leaves thereon to match. Sounds like Lil is lookin' good this first New Year's Eve after America officially entered World War II. She's mad, but I think more hurt, that Fred didn't ask her out. I doubt he went out with another girl. Did he have the money? Were his savings "untouchable?" If he didn't have the money, I know he would have been embarrassed to say so. Will Burt's attitude that she's "delightful company," but puts "no feeling" into his kisses take precedence over Fred, who knows "all the little innuendos of kissing?" Whatever prevented the New Year's Eve date, Lil's peevish attitude didn't last too long. Her next entry: March, 1942, when she's deep into a quandary: Fred or Burt? To comment, just click on the red word "comments" or "post a comment" below. Thanks for reading. Pearl Harbor was bombed seventy years ago today. 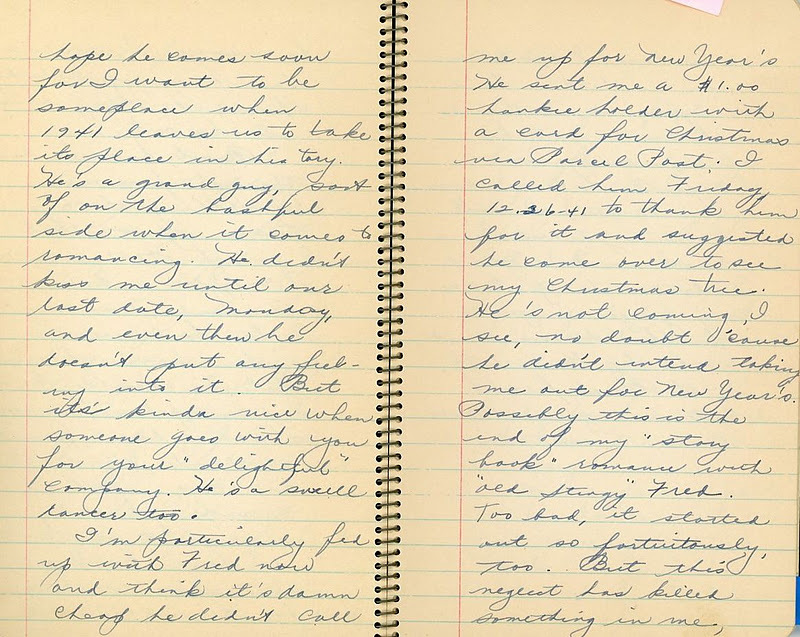 My mom, Lillian Koroschetz, started a brand new diary on New Year's Eve, 1941 reflecting back on the previous year and the effects the barely three-week-old war was already having on the every-day lives of Americans. 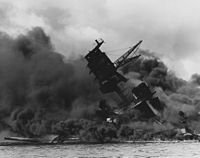 See this link at Naval History and Heritage for a thumbnail sketch of why the attack in Hawaii was such a surprise and how it enraged and united Americans into a singular resolve to defeat Japan as well as the German Nazi and Italian Fascist regimes. Image from Wikipedia "Day of Infamy speech"
By pure coincidence, I am beginning this book practically at the dawn of 1942. What will this New Year bring me––I wonder. For that matter what will it bring the world? This has been a momentous year for the world, rather sad for the world, and a very good year for me. 1941 gave me great happiness with Fred. December 7, 1941 brought the momentous bombing of Pearl Harbor, Hawaii, that definitely entered the United States in the World War #2 in which, in my opinion, we were destined to enter since the repeal of the Arms Embargo Act. So far the war has not yet touched the great mass of us as much as it probably will have by 12-31-42. We already have a taste of it by the rapidly rising prices in everything, federal tax of 10% on luxuries ($1.65 "Nylons,") which, however give a tremendous amount of wear. speech, Congress declared war on Japan. Automobile tires, too, are unobtainable for civilian use, and car production will be eliminated in favor of defense activities by the auto plants. I have a firm conviction there will be a severe depression in possibly 5 or 10 years and I am determined to save some money. I have a start now, $34.00 in postal savings. Also I buy 10 cent defense stamps. When I have saved sufficiently by way of these stamps, I shall buy an $18.75 defense bond. Ever practical and pro-active, Lil was planning for how she would personally respond to the the war. Next week: Lil's leaves the topic of war behind to prepare for New Year's Eve and be "damn mad" at Fred for not asking her out! All is not well on the Lil and Fred front. Lil meets another fellow who gets into serious contention with Fred for Lil's affections. 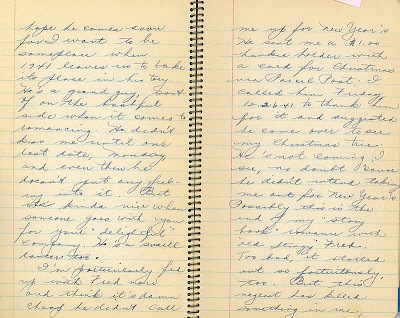 (To start at the beginning of Lil's charming diary posts about her budding romance with Fred Gartz, go to Falling in Love 70 Years Ago and follow the weekly posts to the present). At the moment I’m plenty mad at Fred. Didn’t take me out Saturday so I went to the Chateau where I met a grand young man named Burt. He wanted to take me to a party next Saturday. Said no thinking Fred would call for that nite. No call yet. He always waits till the last min, damn him. If he doesn’t call, I won’t refuse other dates for him any more, and that’s for sure. Lil doesn't write in her diary again for a couple months, but then she catches up with what had occurred just after this last entry. Halloween week I was really a "belle." 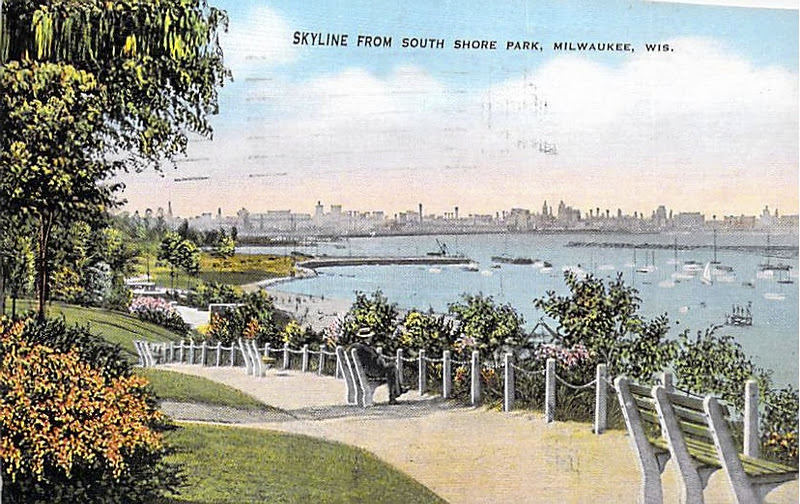 Managed to go out with Burt Wehlte Saturday, 11-1-41, for he phoned me that day wondering whether I still couldn't go out with him. I said, yes, I could, since the previous "engagement" I told him I had for that evening turned out to be the previous evening. The truth, of course, was that Fred didn't call to take me out as I had expected. I had a lovely time with Burt at a house party. Friday, Halloween Eve, I went to the Chateau and met Johnny Lynn, a young soldier (draftee) on leave. We went bowling and to some night clubs and had a grand time. He took me out, too, Sunday November 2, and Burt wanted to take me out that Sunday. Fred, too, phoned Saturday evening for a Sunday horseback riding date, and I was so annoyed I couldn't make it. Apparently he was broke for Halloween. So three possible dates for one day ain't bad! The world had changed by the time Lil caught up in her diary! 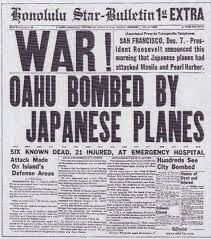 I'm thinking of today's date, seventy years ago: December 6, 1941. It was the last day that American mothers (and fathers) of young men could rest easy for the next three and a half years. The next day, December 7, 1941, they would never forget just where they were when they heard the shocking news: the Japanese had bombed Pearl Harbor at 8 a.m. Hawaii time, and America was now destined to enter the war. 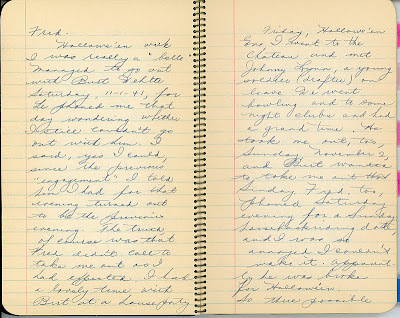 Tomorrow, on the 70th anniversary of the bombing of Pearl Harbor, I'll post Lil's ruminations on how the war had already affected every-day life by December 31, 1941, three weeks after the Japanese attacked, and her thoughts about the future. Then next Tuesday, we'll view her harsh opinions of Fred for not asking her out for New Year's Eve, 1941! I'm keeping my posts within about 300 words to make them a fast read--just a nugget of history in your busy days. Please click on the red word "comment" or "Post a comment" below to leave any thoughts.